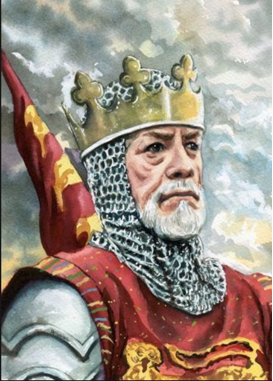 Edward I was born June 17, 1239 at the Palace of Westminster in London, England. His death was July 7, 1307 (age 68) at Burgh by Sands, Cumberland, England. His burial was October 27, 1307 in Westminster Abbey, London, England. Edward I became king of England in 1272. As king, he conquered Wales and tried to gain control of Scotland. Edward belonged to the Plantagenet family of English rulers. He's my 13th cousin, 20 times removed through my Mother's family line. He also is, in my father's family line, the 11th great grandfather of the 1st husband of Alice Carpenter, my seven times great grandmother. In addition, King Edward I is the 24th great grandfather of our son-in-law, Steven O. Westmoreland, meaning that our daughter married well into Royalty! Steve and Tiffany are thirty-fourth cousins, four times removed. King Edward I also had a relationship with the first elected President of the United States, George Washington! Edward I was born in Westminster (now part of London). He succeeded his father, Henry III, as king. Edward fought two wars against the Welsh, one in 1277 and another in 1282 and 1283. He conquered Wales in the second war. In 1301, Edward gave the title Prince of Wales to his son, who later became Edward II. Since then, it has become customary for English monarchs to give the title to their oldest son. Edward was called "Longshanks" due to his great height. He was perhaps the most successful of the medieval monarchs. The first twenty years of his reign marked a high point of cooperation between crown and community. In these years, Edward made great strides in reforming government, consolidating territory, and defining foreign policy. He possessed the strength his father lacked and reasserted royal prerogative. Edward fathered many children as well: sixteen by Eleanor of Castille before her death in 1290, and three more by Margaret. In addition, there supposedly is an illegitimate child as well. Edward held to the concept of community, and although at time was scrupulously aggressive, ruled with the general welfare of his subjects in mind. He perceived the crown as judge of the proper course of action for the realm and its chief legislator; royal authority was granted by law and should be fully utilized for the public good, but that same law also granted protection to the king's subjects. A king should rule with the advice and consent of those whose rights were in question. The level of interaction between king and subject allowed Edward considerable leeway in achieving his goals. Edward I added to the bureaucracy initiated by Henry II to increase his effectiveness as sovereign. He expanded the administration into four principal parts: the Chancery, the Exchequer, the Household, and the Council. The Chancery researched and created legal documents while the Exchequer received and issued money, scrutinized the accounts of local officials, and kept financial records. These two departments operated within the king's authority, but independently from his personal rule, prompting Edward to follow the practice of earlier kings in developing the Household, a mobile court of clerks and advisers that traveled with the king. The King's Council was the most vital segment of the four. It consisted of his principal ministers, trusted judges and clerks, a select group of magnates, who also followed the king. The Council dealt with matters of great importance to the realm and acted as a court for cases of national importance. Edward's forays into the refinement of law and justice had important consequences in decreasing feudal practice. The Statute of Gloucester (1278) curbed expansion of large private holdings and established the principle that all private franchises were delegated by, and subordinate to, the crown. Royal jurisdiction became supreme: the Exchequer developed a court to hear financial disputes, the Court of Common Pleas arose to hear property disputes, and the Court of the King's Bench addressed criminal cases in which the king had a vested interest. Other statutes prohibited vassals from giving their lands to the church, encouraged primogeniture, and established the king as the sole person who could make a man his feudal vassal. Essentially, Edward set the stage for land to become an article of commerce. Edward concentrated on an aggressive foreign policy. A major campaign to control Llywelyn Gruff of Wales began in 1277 and lasted until Llywelyn's death in 1282. Wales was divided into shires, English civil law was introduced, and the region was administered by appointed justices. In the manner of earlier monarchs, Edward constructed many new castles to ensure his conquest. In 1301, the king's eldest son was named Prince of Wales, a title still granted to all first-born male heirs to the crown. Edward found limited success in extending English influence into Ireland: he introduced a Parliament in Dublin and increased commerce in a few coastal towns, but most of the country was controlled by independent barons or Celtic tribal chieftains. He retained English holdings in France through diplomacy, but was drawn into war by the incursions of Philip IV in Gascony. He negotiated a peace with France in 1303 and retained those areas England held before the war. In 1292, Edward chose John de Balliol as ruler of Scotland from among several men who claimed the Scottish throne. Edward demanded that Balliol pay homage to him. But this demand humiliated the Scottish people, causing them to revolt. In 1296, Balliol joined the rebel forces, but Edward forced him to surrender. Edward then took to England the Stone of Scone, the stone upon which Scottish kings had been given royal power for hundreds of years. He placed the stone in Westminster Abbey, where English monarchs were crowned. But the Scots continued to fight England. They were led first by William Wallace and then by Robert Bruce. Bruce was crowned king of Scotland in 1306. Edward died while on his way to subdue the new king. This story was made known in the public's mind with the 1995 Mel Gibson theater movie, "Braveheart." This movie decidedly put Edward in a bad light, as it's intent was to glorify the cause of the Scotts and their hero, William Wallace. Edward's Scottish policy resulted in hostile relations between the English and the Scots for the next 250 years. It also led to an alliance between Scotland and France. As a result, England had to fight both countries at the same time. Edward's need for money to supply his army and government led him to call Parliaments more often than had any previous king. These Parliaments consisted of representatives of the nobility, the church, and common people. In return for grants of money from Parliament, Edward agreed that taxes could be levied only with Parliament's consent. He also sponsored laws on more topics than any previous king. Magna Carta of 1215 issued by Edward's grandfather, King John, did not end the struggle between British Kings and the barons. Neither side intended to abide by the charter completely. Pope Innocent III canceled the charter after King John requested it, and war broke out immediately. After John's death in 1216, however, his son Henry III and later English kings promised to abide by the charter. The most famous of these promises was that of Edward I in 1297. Through these promises, the charter came to be recognized as part of the fundamental law of England. King Edward's edition was 37 sections or paragraphs, all of which became what is called codified law. Amazingly, ten of those paragraphs remain today in English legislation. Edward I was not the first English king named Edward. People in England give numbers to their kings and queens with the same name only if the monarchs ruled after the Norman Conquest of 1066. There were three Anglo-Saxon kings named Edward who ruled England before 1066: Edward the Elder (870?-924), Edward the Martyr (963?-978? ), and Edward the Confessor (1002?-1066). The only copy of the Magna Carta issued by Edward that was allowed out of England belonged to H. Ross Perot, Sr., a Dallas, Texas resident and friend of this writer. It belonged to the Perot Foundation, a non-profit educational organization which he created. Ross generously made a reproduction for my own records. Today, I have handed it down to my son, Taylor Marcus Sharpe. There are 17 copies of the various issues of the Magna Carta which survive today. Four from the rein of King John I, eight from that of Henry III, and five from Edward I. Fifteen remain securely in England, one is in Australia and one is the in America. Mr. Perot purchased the 1297 edition of King Edward in 1984 for a reported $1.5 million. It was loaned virtually all the time of his Foundation's ownership to the United States Archives. It was displayed occasionally in Independence Hall, Philadelphia. The rest of the time mostly was on display in the National Archives Building in Washington DC, alongside of the Declaration of Independence. However, in 2008, the Perot Foundation auctioned the Magna Carta for $21.5 million to an anonymous buyer. The Perot Foundation is the extensive source of philanthropy directed by Mr. Perot, benefiting scores of causes. This sale funded support for more good causes. Later, it was reported that the purchase was by Mr. David Rubenstein, the managing director of the Carlyle Group. The document has been kept on display at the National Archives.